The John G. Watson Foundation is looking to support local entrepreneurship events and competitions with the goal of enhancing the entrepreneurial atmosphere in the local community. Currently, the Foundation supports initiatives such as the annual John G. Watson Quick Pitch Competition presented by the San Diego Tech Coast Angels, and the UCSD Entrepreneur Challenge. We are constantly looking to identify similar programs to expand our impact and reward individuals making waves in the community through the use of innovative ideation. The San Diego region houses a number of major universities, such as San Diego State University, UC San Diego, and University of San Diego, as well as various other community colleges. Many of these institutions support entrepreneurship in different capacities, including student-driven entrepreneurial events and business and ideation competitions. 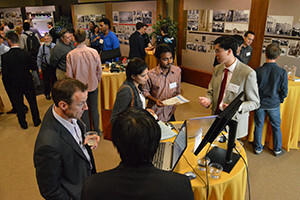 For example, the San Diego State University hosts the annual LeanModel™ Competition that is designed to assist and reward student based startups that utilize the business model canvas, while UC San Diego hosts the annual UCSD Entrepreneur Challenge that unites multi-disciplinary teams of engineers, scientists, and business-minded students with local area entrepreneurs and professionals. Events such as these, that challenge individuals to think critically and encourage innovation, are the types of programs the John G. Watson Foundation is interested in sponsoring. If you are aware of any local entrepreneurship events or competitions in need of support that align with the mission of the John G. Watson Foundation please contact us and submit your suggestion.